Prysmian low smoke zero halogen cable glands are specified to ensure safety during fire – low fire hazard cables should be terminated using cable glands which do not emit toxic gas and suffocating smoke in fire conditions. Understanding the relationship between fire, cables and cable glands and their impact in fire safety is essential to safeguarding life and protecting buildings. The confusing proliferation of cable acronyms including LSZH, ZHLS, OHLS, LSF and LSZH can lead to dangerous under-specification of fire performance cables – the cable terms are not interchangeable, there are vital differences. Todays building specifications ensure the highest levels of public safety and protection through the installation of electrical cable and accessories satisfying British Standards – high density enclosed public buildings include shopping centres, underground rail, airports, tunnels, hospitals and schools. Standard BS5467 power cables with PVC oversheath emit dense black smoke and acid gases in fire conditions hindering evacuation through reduced visibility while threatening lives through asphyxiation. Sensitive electronic equipment in power, control and computer rooms can be damaged. Industrial cable glands kitted with PVC gland shrouds emit choking halogen gases including chlorine, bromine and fluorine in fire conditions therefore careful selection of low smoke and fume or low smoke zero halogen cable glands must be undertaken to avoid compromising the performance integrity of the cable circuits and electrical systems. BS6724 low smoke zero halogen cables emit very low levels of smoke and non-toxic levels of halogen gas (typically under 0.5% HCl emission). BS EN 50525-3-11 is the British Standard controlling 450/750V electric cables for fire performance applications with halogen-free thermoplastic insulation and low emission of smoke. This British Standard test measures gases evolved and emitted during combustion of materials from cables and glands and determines the levels of halogen acid gas content – low smoke zero halogen cables are PVC free unlike LSF cables ensuring lower smoke opacity and toxic gas emissions preventing flame from spreading and reducing heat release. 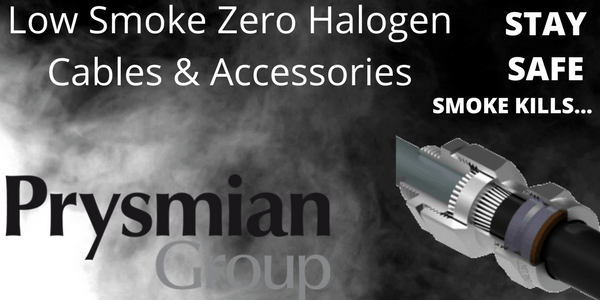 Prysmian Cable Accessories with low smoke zero halogen specification including cable glands and cable cleats to suit Afumex cables.